TTD jumped to celebrate the rathasapthami celebrations in one day in Thirumala. The celebrations will be held in Thirumala from 24th to early evening. Every two o'clock on a vehicle ... Swami will be seen on all day long vehicles. Tatti makes a huge arrangement to celebrate this one day celebration. No celebration, no celebration, no processions in the eyes of the Kaliyuga Deyam Thirumala Sriwari is a great honor. Particularly devotees participate. Every year the Tirthi at the time of the Brahmotsavam is celebrated on the occasion of the birthday of Radha Sapthi, the birthday of Surya Bhagavan. From 5.30 am to 7:00 pm, Swami will be among devotees and give a vision. The festivities that started with the Sun Prayer ... take place all day. A small car, a garage vehicle, a human vehicle, a car park vehicle, a car park vehicle and a moon vehicle vehicle service. The Rathasapthami is also celebrated in the temples of Teddyadhi. The rathasuptami ceremony at Thiruchanur Sripadamavati Amman Temple will be started at 7 am with sunsets. Amma will be decked up at 9.30 pm by the mother of the sons of Simha, Ashwa, Garuda, Major, Chandra Prabha and Gajavas. Rathasaptamy will be held at Velasini Srisurayanarayana Swamy Temple near Thiruchanur. At 6am, Swamy will offer Ashwas to the devotees. Swamy and Ammavar are celebrating the rituals in Tirupati Sri Govindarajaswamy Temple. 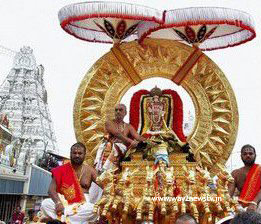 This chariot is celebrated at Thirumala level and is celebrated in all the Teddi affiliated temples of Tirupati.